Happy Tuesday everyone! I usually make our weekly posts on Monday, but I guess I was on mental vacation yesterday! Sometimes it is good to do that I think. 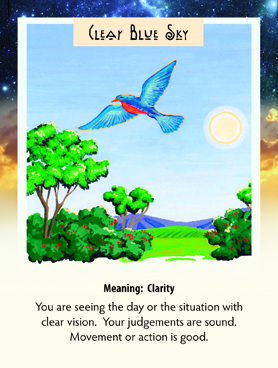 It seems this week we are all seeing things clearly and that we can trust our decisions about things. When we first moved to Temecula, I was shocked to see how many stars we see in the sky at night…because the air is so clear. There is a coastal breeze that blows through the Rainbow Pass and right through our yard with great velocity year round. At first I didn’t like so much wind in my yard, but then my friend Ariel pointed out that all that air movement is spiritual ENERGY moving right through my yard. That is why our skies are so clear! Remember a time in your life that you first put on glasses to see better or looked through a telescope or microscope to see things you couldn’t before. I marvel at what we are able to experience under the water now when scuba diving or snorkeling…how long did mankind have to wait for THAT vision. Try to “feel” that joy of clarity of a new vision because that is what you are giving yourself this week. Trust and feel that you are seeing clearly, as if you just put on some new kind of glasses….glasses of your own invention.